I dreamt about this cookie. Little things from my to-do list creep inside my brain and hang around at nighttime. I fell asleep asking myself ‘what am I going to do with those two languishing candy canes in the pantry? ?’ and then I had sweet, sweet cookie dreams. Maybe we’re all dreaming about cookies this time of year. Santa can’t be the only one already thinking of endless plates of Christmas cookies! I’m ready for holiday parties and potlucks, and the general merriness that comes this time of year when no one declines dessert. It’s a dessert lover’s dream. This is a basic drop sugar cookie recipe, meaning you don’t have to roll out the dough and cut it. You do have to roll it in balls in your hands, but I think you can manage that. It has a little cream of tartar to help keep the cookies chewy (another lesson I learned from America’s Test Kitchen). The dough has a double hit of peppermint with crushed candy canes and Nielsen-Massey peppermint extract. I’ve found that a lot of the grocery store peppermint extracts are reminiscent of toothpaste. Not this brand. It smells sweet and minty, the way it should. I want to dab it on my wrists as perfume all winter long. But instead, I’ll put it in cookies, tip it in chocolate mousse, and splash it in every cup of hot cocoa! I saved about a tablespoon of crushed candy canes to place on top of the cookies before baking. It’s entirely optional, but if you do this, don’t leave the pieces too large, or they make craters in the cookies while they bake. Candy cane dust is really what we’re after. There are some pieces of candy cane in this photo that are too large. Don’t be like me. Except do be like me and turn your cookie dreams into reality. Life is so, so sweet! In a large bowl, beat the butter for about 15 seconds to break it up, and then slowly stream in the sugar while continuing to beat. 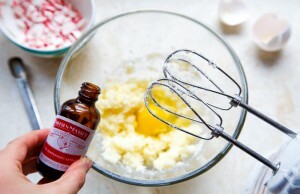 Next, add the egg and peppermint extract and beat until combined. In a separate bowl, combine the flour, cream of tartar, baking soda and salt. Add this in two increments to the wet ingredients, beating in between each session. Be careful not to over-mix. Finally, beat in the crushed candy canes, but save about 1 tablespoon of the candy canes for garnish. Divide the dough in half by eye in your bowl, and aim to get 6 cookies out of each half. Roll each dough in your hands to make a neat ball. Place the cookies on the cookie sheet evenly spaced. Sprinkle the reserved crushed candy cane on top of each. Bake for 10-12 minutes. The cookies are done when the edges are starting to turn light golden brown. Let cool on the baking sheet for 5 minutes before moving them to a cooling rack. To make the white chocolate glaze, combine the chocolate and oil in a microwave-safe bowl. Microwave on 50% power in 20 second pulses until the chocolate melts. Stir between each pulse. Drizzle each cookie with glaze before serving. I kind of LOVE when I dream about the things I’m going to make, is that weird? Also, I need to get with that peppermint extract, mine tastes like Colgate in a cookie, blegh! These are too cute! Love that drizzle! I saw the teaser on Facebook and got all sorts of excited! 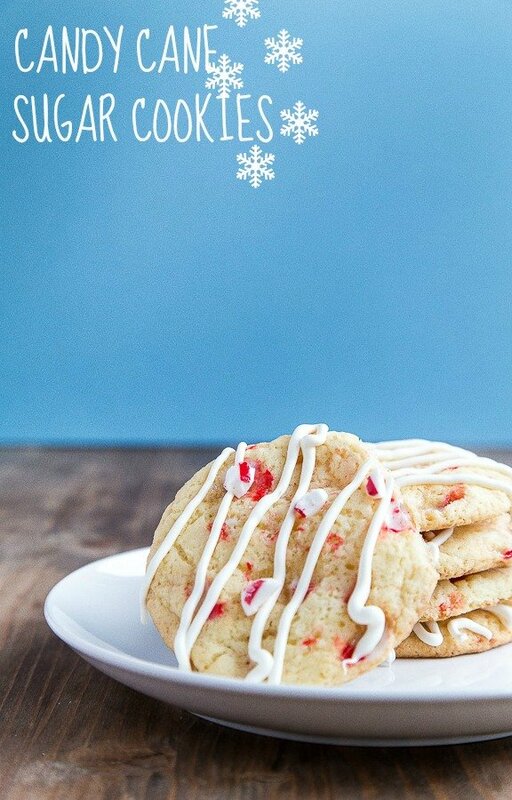 Soft cookie + crunchy candy cane = Christmas win! Pinned! Love this – I need to bake up a batch right now! Love how simple and festive these are! Love the double dose of peppermint – that’s a double dose of genius! I recently tried topping cookies with candy cane pieces, and they melted everywhere. Yours look like how I dreamed mine to look! There’s a little neighborhood bakery that makes a peppermint sugar cookie and it’s my favorite this time of year. I’ve been wanting to recreate it, but I think you just saved me the work. Can’t wait to try these! I love your photos! Peppermint is so “Christmas”! They sound delicious! Love these! I was just thinking about adding candy canes to my favorite sugar cookie too! Sounds so yummy! I’ve been on a peppermint craze lately – peppermint ice cream, check! peppermint hot chocolate, check! And now peppermint cookies, check!! So festive. 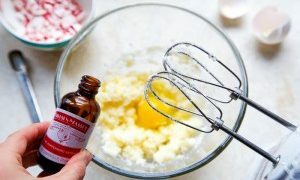 Love America’s Test Kitchen tips! They always lead to awesome results! Like these cookies for instance. Dying over how pretty those candy canes look on top! Best dream ever for sure. :D Pinned! loooove these!! candy canes are so good! Nice tip on the peppermint extract, you’re so right about a lot of them smelling like toothpaste. 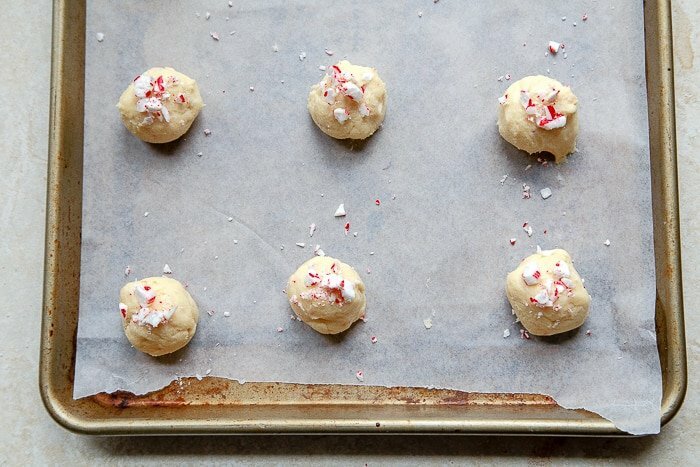 I love that these are roll in a ball drop sugar cookies, so much easier and just as cute! A perfect taste of Christmas! These are the stuff dreams are made of! Look so good! You know, I recently read that the cream of tartar = chewy cookies tip was false. Can you believe the LIES people are writing on the internet these days? :) I haven’t looked into the science of it, but it’s fact that cream of tartar makes sugar cookies infinitely better and these look perfectly Christmas-sy and amazing! P.S. I support using any kind of baking extract as perfume! Food dreams are the best kind of dreams. Just the other night I had a dream about hot chocolate peppermint muffins. Looks like we all have peppermint on the brain. These look amazing. Pinned. These look so yummy, Christina! Love the crunchy peppermints on top. Nope Santa isn’t the only one doing that kind of dreaming. I love sugar cookies. You partied them up in a very festive way! How cute can cookies possibly get? These are adorable! Thank you, thank you, THANK YOU for the perfect cookie to make with my grandson for Santa Claus! These cookies smell amazing while baking and taste positively delicious! Sure hope Santa will be happy with the three we didn’t eat :-) Merry Christmas! I made these yesterday and everyone in my family loves them! I didn’t have any chocolate so I couldn’t put the glaze on. They were amazing without it though. Thanks for the great recipe. Where do you purchase Nielen-Massey peppermint extract. Your recipe stays soft? so many sugar cookies get hard and do not stay soft. I was once told the butter is what causes the problem, told to split with butter flavored Crisco or could use coconut solid shortening. I buy it either online or at Williams-Sonoma. And yes, butter is firm at room temperature, so the cookies firm up, but they’re not overly hard. Recipes that use crisco would definitely be softer and more chewy.